Traveler Ratings for Private Tour in Rome, Lazio, Italy by Tour Guide Cosimo F.
We were a party of 8 first-timers in Italy—all were very impressed with his itinerary, choice of restaurants, and most importantly attention and care to all our needs. We had Six wonderful tastings that were punctuated with brief but very interesting info sessions on landmarks in Rome. We never felt rushed which was very important to us. He went above and beyond his "job" by helping us plan the rest of our day after the tour. We did four tours with this company and he was hands-down our favorite! TOUR GUIDE RESPONSE: Thanks to you and your very nice family for the amazing morning spent together!! I am really pleased you enjoyed food, our traditions and history and art history as well. I hope you will come back to Italy and Rome very soon. For now, as we say in Italian, mille grazie and ciao ciao!! Cosimo was an outstanding guide. Very interesting historical facts as well as some of the best food we have ever experienced. 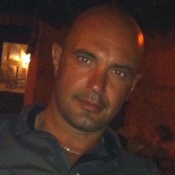 I would highly recommend Cosimo and when we next visit Rome, we will request him as our guide again.